This article is my response to a grower’s question about lowering soil pH in a high tunnel. The soil test indicated pH of the soil in his high tunnel was 7.7. The high pH could be partially caused by alkaline water he used to use for irrigation. The grower has changed the water source, but high soil pH is still a concern. Following is my response to the grower’s question. My response is mainly based on the publication ‘Lowering Soil pH for Horticulture Crops‘. Purdue Extension HO-241-W.
We have a few choices to reduce soil pH. Adding elemental sulfur is one way to do it. 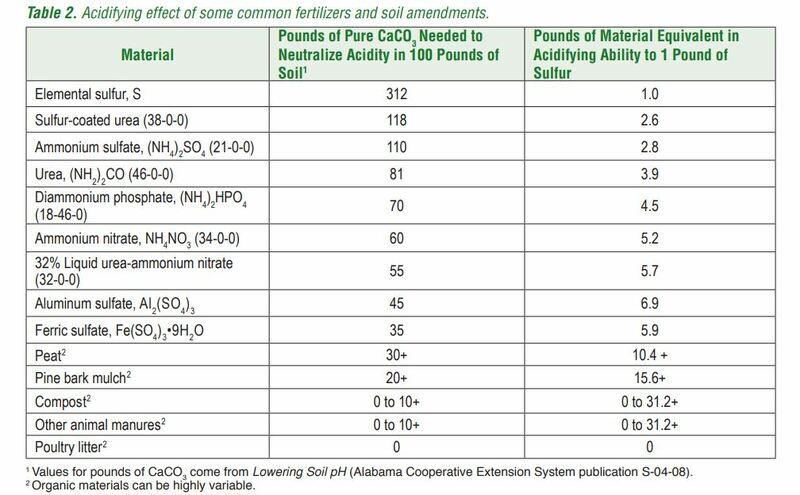 If you want to reduce soil pH from 7.5 to 6.5, add 2 lbs elemental sulfur per 100 square feet. Note footnote of the following table, the amount changes based on soil type (‘For sandy soils, reduce amount by 1/3; for clay soils, increase amount by 1/2’). The way elemental sulfur works is through a biological process: bacteria in the soil convert elemental sulfur to sulfuric acid, which reduces soil pH. Because microorganisms are involved, soil conditions such as temperature determine how effectively these tiny guys work, and the conversion process needs time. Another way to reduce soil pH is through using acidifying nitrogen fertilizers. Since you need to add nitrogen anyway, it kills two birds with one stone. Nitrogen fertilizers containing urea or ammonium can reduce soil pH, but nitrogen fertilizers containing nitrate increase soil pH in the long term. You used potassium nitrate and calcium nitrate last year. They worked well, but it would not be a good idea to stick with it this year. Keep using them will continue to increase soil pH!!! The good news is that we have plenty of potassium and calcium in the soil, which we know tomatoes need. This year, we should use more of an ammonium-based nitrogen source. You could apply some urea preplant, and inject 28% liquid nitrogen during the season. Ammonium sulfate can also be used preplant or through the drip depending on the forms. The effect of ammonium-based nitrogen fertilizers on reducing soil pH is relatively minor compared to elemental sulfur. 3.9 lbs of urea is equal to 1 lb of elemental sulfur in terms of reducing soil pH. So if you decide to apply 30% the amount of nitrogen recommended from the soil test lab (105 lb/A) using urea applied preplant, the effect of the in reducing soil pH is similar to applying 0.04 lb elemental sulfur per 100 square feet. Remember, the recommendation is to apply 2 lbs elemental sulfur per 100 square feet. If the calculations make sense to you, you can work out a fertilizer plan for this season, and calculate the acidifying effects by using ammonium-based nitrogen fertilizers, and then decide whether or how much elemental sulfur you still want to add. Another thing you may consider is whether the material is applied only to the bed area or the entire area of the high tunnel.